The CLP Regulation (CE) 1272/2008 aligns previous EU legislation with the GHS (Globally Harmonised System of Classification and Labelling of Chemicals), a United Nations system to identify hazardous chemicals and to inform users about these hazards. It also has links to the REACH legislation. The CLP Regulation entered into force on 20 January 2009 and progressively replaced the classification and labelling of Dangerous Substances (67/548/EEC) and Dangerous Preparations (1999/45/EC) Directives. Both directives were repealed on 1 June 2015. GHS has been adopted by many countries around the world and is now also used as the basis for international and national transport regulations for dangerous goods. The hazards of chemicals are communicated through signal words and pictograms on labels and safety data sheets. New red-framed pictograms replace the familiar orange danger symbols. signal Words (e.g. Danger, Warning) replace the Indications of Danger. Watch Napo in.... Danger: Chemicals! In most cases, suppliers need to decide on the classification of a substance or mixture. This is called self-classification. In some cases, the decision on the classification of substances is taken at the community level to ensure adequate risk management. Member States, manufacturers, importers and downstream users may propose the classification and labelling of a substance to be harmonised across the European Union. Information will also be made available in the C&L inventory. These are usually the most hazardous substances: carcinogenic, mutagenic, toxic for reproduction or respiratory sensitisers, biocidal or plant protection products. All previously harmonised substance classifications under the previous legislation (Dangerous Substances Directive) have been converted into CLP harmonised classifications. It is mandatory for the suppliers to apply this harmonised classification and labelling. 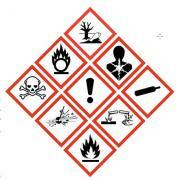 Look out for new hazard labels and safety data sheets (SDS). Train workers to understand and recognise the CLP-labelling information. Check that your use of the substance or mixture is covered in the SDS and is not advised against. Follow the advice provided on the new labels and in safety data sheets. Check whether the classification has changed. Evaluate the risks to workers and update your workplace risk assessments if necessary. If you are an employer, communicate these changes to your workers. If you have any questions about the new label or safety data sheet, speak to your supplier. The Classification & Labelling (C&L) Inventory is a database with basic classification and labelling information on notified and registered substances received from manufacturers and importers. It also contains the list of legally binding harmonised classifications (Annex VI to the CLP Regulation). It was established and is maintained by ECHA.